Thomas has now reached the Mediterranean! It was exactly one week ago that he started his second attempt to get to the Atlantic surf aboard his SUP board. His wrist is now better and his stomach is now able to cope with waves and picnics! 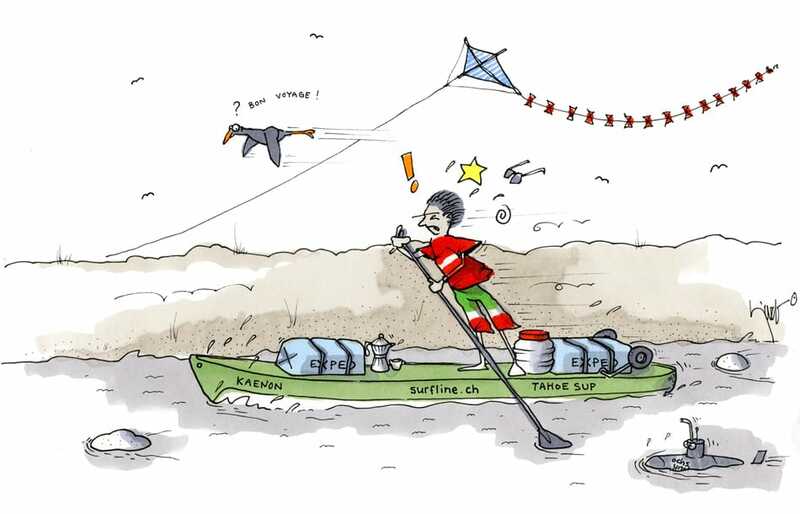 Having already paddled from Mollis via Basel and on to Mulhouse in France and further along the contaminated canals there, this time he started in Geneva. Despite dramatic south winds with storm warnings and wind speeds of up to 100 km/h (60 mph), he’s making good progress. It goes without saying that our adventurer can guess what’s awaiting him in the Atlantic. His board is buffeted by sidewinds due to the pack strapped to it. Eating remains a challenge. The Rhone Canal was amazingly quiet, and many of the villages Thomas passed were equally devoid of life. There were very few eateries along the way, and those that he did come across were beyond his budget.